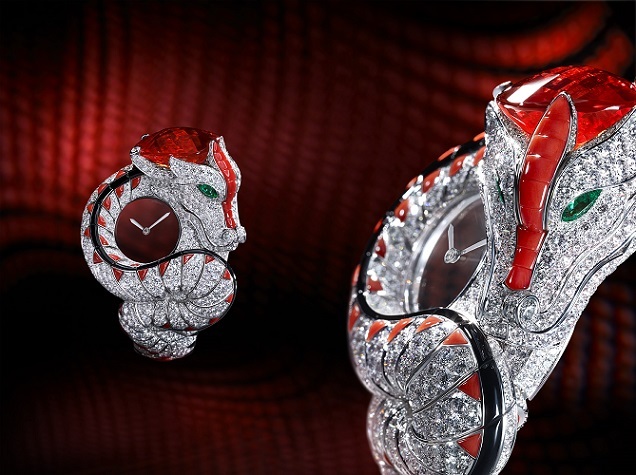 Passionately curious about distant civilizations, Cartier has often brought back dragons from the East for its High Jewellery workshops. These creatures of fantasy, once duly installed at Rue de la Paix, serve as an invitation to dream, contemplate, and share this unique beauty. They have even become the motifs for watches fitted with fascinating mechanisms, combining the power of their heritage with the exceptional expertise of the Maison. A fierce and protective animal of fantasy wraps itself around a mysterious dial in a never seen before swirl of diamond-set scales. This enigmatic creature is endowed with emerald eyes and a bewitching presence. A line of onyx brings tension and dynamism to the composition, housing the movement within its undulating forms. On either side, coral provides structure and rhythm to the design, even marking out the animal’s profile. Between its horns lies a faceted cushion-shaped 23.77-carat fire opal, the stone which symbolises life, strength and energy all combined. Between sculpting, mounting the stones, gem-cutting and cutting to measure, some 1,100 hours of work were required to bring this creation to life. The colours create a vibrant chromatic harmony, a veritable Cartier signature. 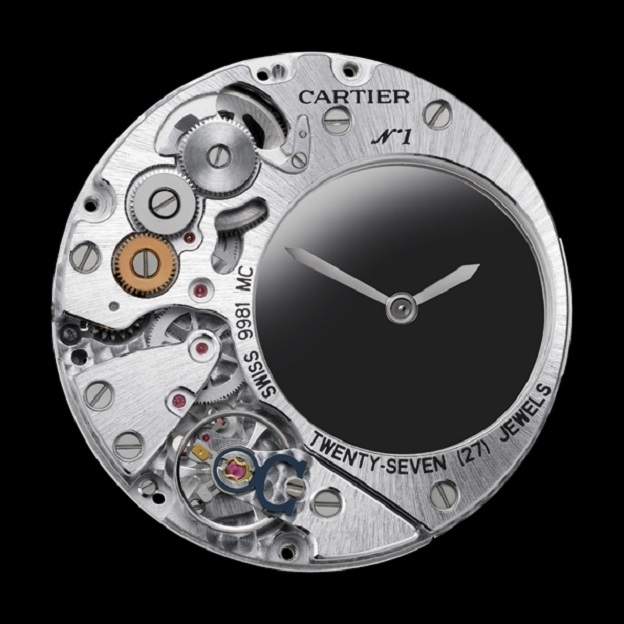 A worthy successor to the mystery movements that began appearing at Cartier in 1912, this sheer spectacle of time perpetuates the enigma of their complexity. This powerful work merges magic and mystery, poetry and fantasy. Confident and generous in its dimensions, and dazzling in its presence. 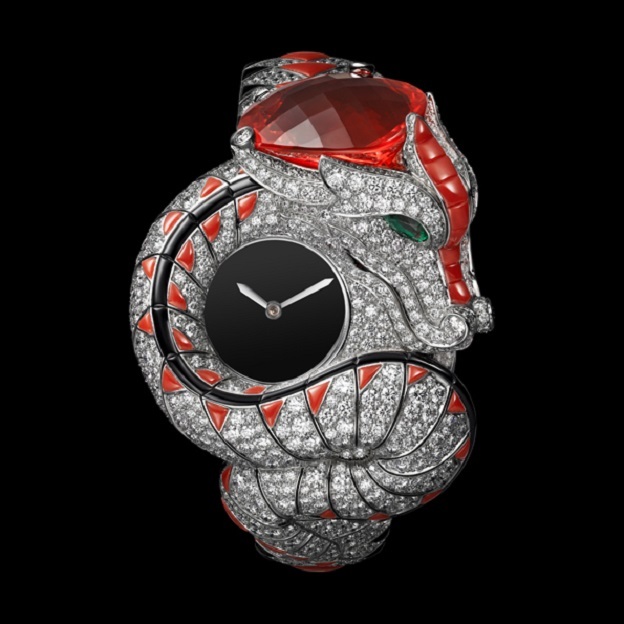 Dragon Mystérieux watch White gold, one 23.77-carat cushion-shaped fire opal, diamond, coral, onyx, emerald eyes. 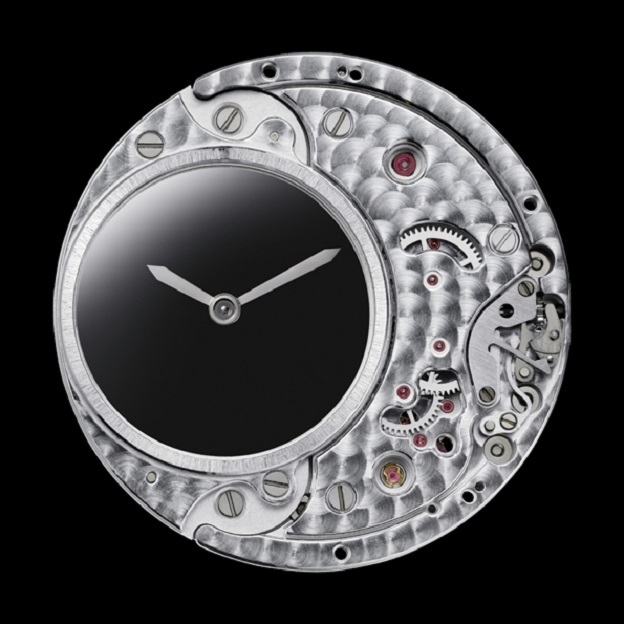 Manufacture mechanical movement with manual winding, calibre 9981 MC, with mystery hour and minute display. Unique piece.